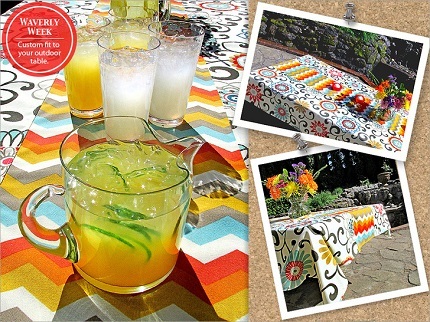 Sew4Home shows how to make this tablecloth for your patio or outdoor table. It’s made from outdoor fabrics stand up to the elements. Pockets sewn in the corners hold weights to keep it from blowing away. When you need to wash the tablecloth, you can easily remove the weights from the pockets. They give cutting dimensions to make a tablecloth to fit a 96″ x 40″ table, but you can adjust them to fit any size table. Go to Sew4Home to see how to make one.